Take Route 3 South to the Sagamore Bridge. Cross the bridge and you are automatically on Route 6, Cape Cod. Follow Route 6 east to Wellfleet (approximately 45 miles). Route 6, on Cape Cod, begins as a divided highway but when you get to Wellfleet, it is only a two lane road. At about mile 99.5 you will turn right onto Lecount Hollow Road. (Watch for the green sign on the right after Route 6 curves left at Blackfish Creek). Follow Lecount Hollow Road to the end. When you come to a large beach parking lot, turn left onto Ocean View Drive. The very first cross street is Wilson Avenue and our cottages are all around this intersection. Take Route 95 to Providence, R.I. When you get to Providence, follow signs for "Cape Cod" and take a right exit onto Route 195. Continue on Route 195 to the very end. Following signs for "Cape Cod" exit onto Route 25. Follow Route 25 and take exit just before the Bourne Bridge "Route 6, Provincetown." Off the exit take rotary (roundabout) 3/4 of the way around following signs for Rt. 6, Provincetown. Follow this road along the Cape Cod Canal up to the Sagamore Bridge. Again, follow signs for Rt. 6, Hyannis/Provincetown. Cross the Sagamore Bridge and you will be on Cape Cod. Follow Rt. 6 east to Wellfleet (approximately 45 miles). On Cape Cod, Route 6 begins as a divided highway but when you get to Wellfleet, it is only a two lane road. At about mile 99.5 you will turn right onto Lecount Hollow Road. (Watch for the green sign on the right after Route 6 curves left at Blackfish Creek). Follow Lecount Hollow Road to the end. When you come to a large beach parking lot, turn left onto Ocean View Drive. The very first cross street is Wilson Avenue and our cottages are all around this intersection. Follow the Mass Turnpike to exit 11-A. Follow signs for "Cape Cod 495 South" Continue on Rt. 495 South. An extension to Rt. 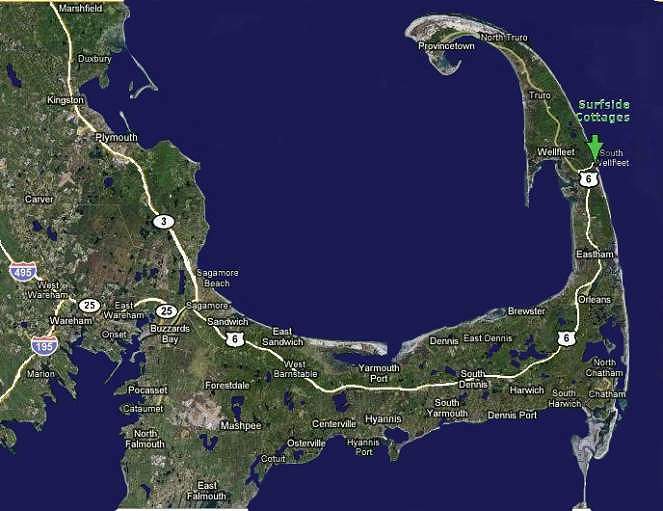 495 was constructed to connect it to Cape Cod. This extension was given a different name (number), therefore Rt. 495 will end and Rt. 25 will begin but it will be the same highway. The last exit before the Bourne Bridge will indicate Rt. 6, Provincetown. Take this exit. Off the exit, follow the rotary(roundabout) ¾ of the way around, exiting towards Rt. 6, Provincetown. This road will take you under the Bourne Bridge and follow the Cape Cod canal to the Sagamore Bridge which you will use to cross the canal. Over the bridge, follow Route 6 East to Wellfleet (approx. 45 miles). Turn right at LeCount Hollow road to the beach parking lot at Ocean View Drive. Turn left onto Ocean View Drive and you will immediately be among Surfside Cottages. Keep in mind that at any time, if you get lost or confused while traveling to Surf Side Cottages, you may call us or email us from a smart phone and we will help.